RONAN – On Tuesday May 8, Ronald Eugene Stonehocker at 7 p.m., surrounded by his family at his cabin on 18 Circle Drive, Thompson Falls, Montana, had a change of address. He entered Heaven to live with his Lord and Savior Jesus Christ. No more pain, no more needles or treatment. He is home. Ron accepted the Lord in 2007 and was baptized. His journey as a born-again Christian inspired others as he took cancer and treatment with the Lord in his heart. He loved talking about his Jesus and he would ask others, “do you know the Lord,” then would go in to conversation about how he was saved by grace and was anticipating going to live with God soon. He lived life every day with a love to share his journey with Christ with others. Ron was raised in Ronan, Montana on a farm. Born July 31, 1947 to Donald Raymond and Yvonne Eloise (Penny) Stonehocker, he always told he was born at St. Patrick Hospital in Missoula but brought home still wet. Typical of a farm boy, he had many adventures with his best friend, Ted Reinlasoder, who passed way several years ago, and the family is sure was at the gates of heaven to welcome Ron. Ron worked construction after graduating high school in 1965 in Ronan. He loved big equipment, he loved to work and is remembered for his numerous fast, molar cars that he raced, restored and showed. He especially wanted a 340 four-speed Plymouth Duster so he and his girlfriend went to Spokane in February of 1975. He told her he would marry her the next weekend if she could find him that car. She had a choice of plum purple or lime green. She chose the lime green and true to his word, they returned the following weekend to marry at the famous Hitching Post Chapel in Coeur d’Alene, Idaho on March 1, 1975. Marilyn Mitzi McDowell became his wife and they shared 43 wonderful years together raising a son, Colt Travis, and a daughter, Sara Meta, on the family dairy farm near Ronan. Together the family worked hard, played hard and shared a love of camping by horseback in the Swan Valley. Oh, the memories, the adventures, and, most importantly, the family time together. 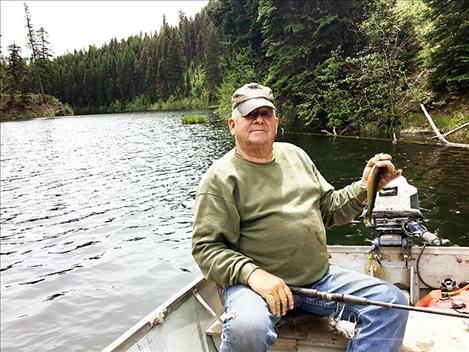 Ron continued to love fishing and even during his treatment time he and his wife would drive to their favorite lakes to fish. Ron is survived by his wife Marilyn Mitzi, faithful dogs Willie and Winnie, son, Colt, his daughter-in-law, Holly, and two granddaughters, Darby and Dillon; his daughter Sara and son-in-law Don, two granddaughters, Seeley and Maizey. The families live in Charlo, Montana. Ron loved his family and especially loved his four granddaughters who remember Papa chasing them on the quads, tickling them and saying grace before eating. His youngest granddaughter, Dillon, asked her dad, “is Papa going to be home from visiting God in Heaven?” Sister Darby chimed in, “we miss Papa, he was so much fun.” Seeley and Maizey feel the same as he loved his girls. A Celebration of Life will be held June 16 at Palmer Park near Charlo, Montana. The family will provide beef tri-tip and Ron’s favorite Kentucky Fried chicken. Potato salad and coleslaw, and his favorite pie, cherry, will also be provided. We invite everyone to attend this celebration and if you want to share a dish, please feel free to bring it. Tables, plates and utensils will be provided and limited chairs. If you can, please bring one or two. A notice will appear again in the local papers as the date gets closer. Directions will be in the notice. John 3:16, “For God so loved the world that He gave His begotten Son, that whoever believes in Him should not perish but have everlasting life.” Amen and see you soon, beloved husband, father, grandfather and friend.